Professional office suite of 493sqm with a well appointed kitchen and meeting areas. 200sqm of professional partitioned office space with access to common area boardroom/meeting room and kitchen facilities. The Park is governed by the State Government’s Industry and Technology Development (ITD) Act (1998), which regulates the nature of businesses that can operate within the park, ensuring tenants’ enterprises have a technological and innovation focus in research and development. The Western Australian Government manages the strategic direction and operations of the park. Approximately 70% of the land is privately owned. 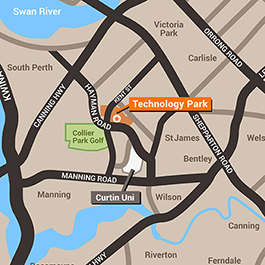 There are various offices and spaces available around Technology Park, please contact Graeme Perry at Burgess Rawson on +61 8 9288 0249.